Street maps for business to increase your online presence. Business View is suitable for almost every type of business, large or small. Hear it from Google and see how important this service is and how it can help your business. Google business view is a 360 interactive virtual tour within any business. Google street view is no longer just for the streets! 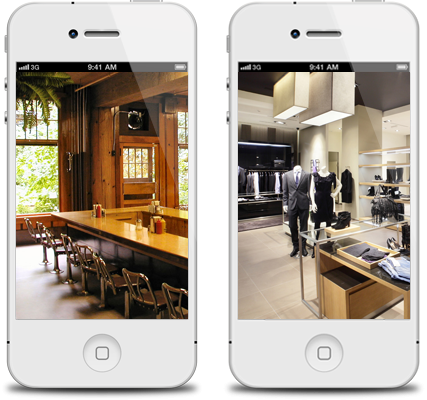 Using googles latest street view technology allows businesses to showcase their interiors which would ultimately enhance their google listing. You can now entice potential customers and have more of an influence on them making a decision to use your products or services. The tour can be viewed on your desktop computer, smart phone and tablet so customers can take a tour on multiple devices. Just click ‘See inside’ and navigate through. This tour is a proven method that will increase enquiries, visits and bookings and ultimately increase sales. Contact us today to see how can create a Virtual Tour for your business. Improve your visibility and online presence with google searches. Business View is suitable for almost any type of business, large or small. Only a google certified photographer will take the photos at your business. We have flexible bookings dates around your working schedule. Google Maps Business View is a great new way to see local businesses in your area. Google Maps had long given users a great way to look around areas and not get lost with great and extensive coverage of all the local areas, establishments, and landmarks that were available. They further increased that coverage with Street View where users could actually have a view of local streets and areas from the first-person as if they were walking the streets themselves. Since launching just over two years ago, Google Business View is helping thousands of SME’s enhance their online presence and attract more customers. Over 300,000 businesses in over 30 countries can now be ‘visited’ without ever moving away from the screen. One of the many advantages of Google Business View is that it sidesteps the need to invest in a costly domain name or create a website, yet still uses on the tools and technology with which millions are familiar. Google Business View takes Google Street View one step further by allowing customers to search for your business using Google Maps and then virtually step inside the premises. Once ‘inside’, potential customers can go on a 360 degree virtual tour of your business and premises, enabling them to make a much more informed decision. Lets your customers know exactly where your business is, how long it will take for them to get there and precisely what it looks like. Much more cost effective: instead of spending time on the phone or emailing your customers explaining layout, size, features etc, you can simply direct them to your associated Google Business View so they can see for themselves. Allows customers – especially those who have access requirements – to check if your premises meet their needs such as the height and number of steps there are, the width of aisles or any potential obstacles. Early adopters have reported increased traffic both online and in person. Much cheaper way of advertising and promoting your business and brand. Google Business View is another effective means of bringing the business-customer relationship ever closer. By using tools which online costumers are already familiar with and trust, Google Business View becomes an extremely valuable asset: Pegman takes customers off the street and into your store, local search allows customers to find you fast and businesses can use Google Ads to show they also use Business View. 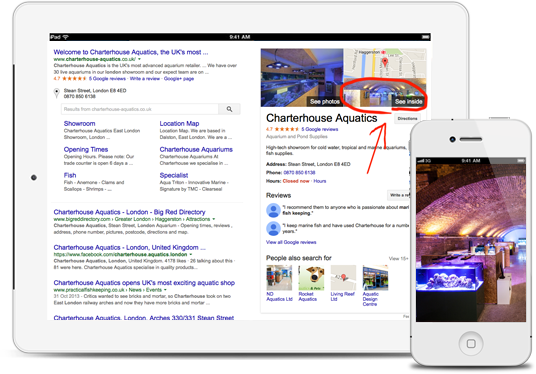 Google Business View helps to increase your rankings, plus it shows up in your knowledge graph and your maps tab – making your business much more visible to customers. And, speaking of visibility, a 350 degree virtual tour is instantly more impressive and appealing than a series of static images or an embedded video that’s slow to load. An enhanced spatial understanding of your business and premises fosters trust, familiarity and, for customers, a sense that they’re already there! So. Who takes the photos for my business? In short. We do! Google has appointed a series of ‘trusted photographers’. Fully trained and skilled in ‘stitching’ together images of your business to create the virtual tour. Simply schedule a photo shoot at a time that’s convenient for you and then after the photo shoot, we take care of the rest. So, if you want to raise your business profile, enhance your brand and increase your online presence, contact us today to see how we can help you open your doors to customers from all over the world.